Shop News: I'm tooting my horn for finally getting the 2018 Bonus Collection finished and added to the PatternBee website! Looking back at those, month by month, it's amazing how fast the year went by. This Redwork motif (Ingall's late 1800's), with a wording modification, was part of the Bonus pattern for February 2018. I wanted to stitch it up as soon as I saw it. I think it works nicely as a decorative towel. I'll be adding it to my Etsy shop soon, along with some more adorable tea towels that Ginger stitched up (below). This one from a 1940's Laura Wheeler embroidery pattern: Dog & Cat Dishes #628. Aren't these sweet? And another one, a vintage mail-order newspaper pattern: Kitchen Songbird #524. She's been doing them up in pairs for the shop, rather than stitching an entire set, but is happy to do custom orders if there's a tea towel set you want done up in your favorite kitchen colors. (Please contact me through MeadowSweet Workshop to set up a special order or click on the image to view the listing details and more pictures). And I've got some more *fresh* vintage patterns to finish up. I'm still working my way through that shoe box! So stayed tuned for those. The dollhouse make-over is nearly done. Will have more pictures to share soon. Gosh. I'm all over the place these days--still just having fun. Hope you are too! New in my etsy shop--one bundle of autumn sachet peeps! Thanks for the quilt love. A random pieced scrap quilt is often full of surprises, so glad it turned out nice. I may do a little more embroidery on it before I add the backing. While I'm thinking on that, I'm getting stuff ready for a local doll show coming up this weekend. Trying not to procrastinate until the very last moment. Like I usually do! Considering how I was just introducing new chicken tea towels in my last post, with links for patterns, my timing for putting PatternBee (and my other web shops) on vacation mode probably seems a bit abrupt! But actually, business in general this month has been very slow, so we are looking at this as an opportunity to get caught up on some house projects. Jam making season is here as well and I want to take my time and enjoy these simple pleasures while they last. All orders that came in over the weekend will be printed and shipped ASAP though, so not to worry. I'm on it. After that, I plan to be quite busy in the kitchen. Or up here cooling off. I'll be posting now and then to keep in touch! Summertime has arrived . . . .
My Mother's Day Bouquet! Hope everyone had a nice day. This is just a quick announcement. 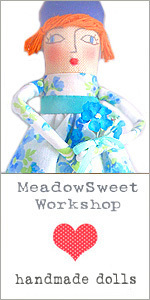 I have a NEW sister-blog: MeadowSweet WorkShop (Follow the link for the scoop). Don't forget to share, subscribe and bookmark for future reference. "In a gentle way, you can shake the world". I am so loving this calendar. I just wish the days weren't skipping by so quickly. Before I know it, it's time to flip another page. And a lovely page it is too. April showers bring May flowers and we are starting to see a lot of them around here. Mostly we have bright pink azaleas, purple hyacinth and tree peonies stealing the show now. So pretty to see--under yet another dark, prevailing gloomy sky. But no matter. These little bright spots make up for it. Speaking of bright spots---I've been working on some more dolls and showboxes and even made a "movie" to introduce my Etsy shop! It's a peek into my workshop and the inspiration behind my creations. It's also a feature on my Etsy about page. Hello again! After a few days of "spring cleaning" and rearranging things here on my blog, I realized I never got my link up for my new etsy shop. I actually meant to set this up months ago, but got busy and forgot all about it! Oh well, better late than never. So there it is . . . Here's a little bit of what I've been up to these past months. This darling doll was made for my youngest granddaughter's 8th birthday. She loved it! Her older sister got one (see below) a few months before that, for her 12th birthday, and she asked for one too. Of course, I was thrilled and got busy with my needle and thread and paper and glue. Here's big sister's doll--with a garden theme. It wasn't entirely planned, but the dolls turned out resembling each of them, which was kind of funny. And here's another birthday present I made for my 17 year-old niece Anna. It also sort of looked like her! Each doll and her ShowBox, come packed in clear cellophane bags and make most special gifts. The hand-crafted boxes have little loops so they can be hung up on the wall. The dolls are removable and can be posed as well; clothing is fixed. Some dolls are wired to the inside of their boxes to keep them from shifting around during shipping. This can be removed or left as is if you just want to display them standing up. My "supplier" for the gorgeous paper flowers and tiny cakes are provided by my daughter Grace. It's great having so many resources nearby in the studio upstairs. She is always having fun setting up props for photo shoots and making things for her Etsy Shop: The Dainty House. Take a peek if you haven't yet. It's amazing. There's a ton more I could show, but my time clock is tick tick ticking away. I mainly wanted to introduce my shop properly and officially. And to celebrate it with a Spring Sale for my ShowBox Dolls! Please visit me on Etsy at MeadowSweet Workshop and check the announcement box for the coupon code if you are interested. That's all for now . . . until next time . . . happy stitching! Autumn is in the air! Can you feel it? The leaves are starting to change color on the trees in our neck of the woods and the squirrels are scampering through my backyard gathering pine nuts to store. I love watching them from the deck and listening to their funny little chirps high in the trees warning us that this is their territory! Here is the October Bonus pattern with our friend the squirrel. It's this month's free with purchase transfer from PatternBee. Nice for a seasonal pillow, picture or what have you. Like a squirrel with a good nut, I am gathering up and settling in with some seasonal stitching too. I may not be as glamorous as Prissy Poodle here, but my stitches are just as fine. Also, I just want to say THANK YOU dear friends for the sweet birthday wishes and the support for Miss Grace's new launch! She has been busy cooking up some new treats and has a really darling autumn collection coming up. Oh my goodness! You will not believe your eyes. She has allowed me to give you this sneak peek and to let you know that the Dainty House shop update will be October 4th--Wednesday. She has a cute Dainty House Blog and will posting more pictures here on Pinterest too. Enjoy! Hello Friends! It's been awhile. I'm still here. Are you still there? I hope so. After a dramatic change in the weather, ushered in by a thunderous rain storm that woke the house last night, it does seem as though autumn is a bit early and pushing through the door. Suddenly, I'm hunting for my warm slippers and pulling out cozy sweaters and reluctantly waving goodbye to the summer garden. I'm not ready. Abrupt transitions are difficult for me sometimes. I'm keeping my fingers crossed that sunny autumn days will replace these gray skies. I'm hanging on to the promise of bountiful roadside stands of pears and pumpkins and brisk walks through the golden woods over paths sprinkled with colorful leaves. In the meantime, while I wait, I am (still) working on the family photo albums. It's been over a year now since I started this epic journey into the past and at times I fear I will never, ever get to the finish line. Needing to scan and Photoshop hundreds of photographs is time-consuming when one starts in the year of 1902. I'm so looking forward to getting beyond year 2000--when cameras went digital. Then I can retire all these heavy, dusty boxes of negatives and prints and start having fun creating the photobooks and getting them printed. I'm ready to wrap it up. Other projects are waiting. Important things. Like a dollhouse that needs redecorating. I try and stay focused, but it's not always easy. In fact, yesterday, while puttering through Hobby Lobby with my crafty cohorts (my two youngest daughters) who were filling the cart with the supplies they needed, I was making a mental checklist, aisle by aisle, of things I could do. That place is huge and my list was growing long. But my resolve to resist was firm! Until I turned a corner and saw this print. My knees went weak. I have no idea what I am going to do with this, but I do so enjoy gazing at it from afar. It's from Brother Sister Design Studio 2017. Those of you so afflicted, know the dilemma. In any case, hoping it provides the thrust I need, a sweet incentive, like a carrot in front of the cart. Here's what's new . . . This jaunty fellow, along with some fine feathered friends, is now available for your stitching delight. Chickens & Roosters #2438, includes six designs, plus one set reversed, for household linens, dish towels, a picnic-table cloth or whatever you please. Motifs are between 5" and 8" high and are worked in the simplest of stitches. And with all the charm of old-fashioned dish towels, Colonial Miss #3475 couldn't be easier to do with running stitches and lazy-daisies. If you are looking for some quick stitching fun, this is it. Another easy-to-stitch towel set: Cross-Stitch Man Cat #4238 ; follow him through the week as he works through his household chores. Thanks again to Bernice (and Alice Brooks) for providing patterns. Hello friends! Hope you are well and getting through winter with smiles and cheers. Are the snowdrops appearing where you are? The crocus are waking up here. Poking their pale, sleepy heads out to see what's been going on during their long winter's nap. Like me and Fufu. Winter is such a solitary time. Lots of huddling and hunkering and dozing. Every morning for several days now we have had a snowfall. So fun to wake up to! So charming and mesmerizing. Eventually it just dissolves into a thin fog of grayness, and sometimes, if we are lucky, into a bright spot of sunshine that pours through the window at the kitchen sink. But March is coming. And who knows what it will bring? Fufu saw her shadow and predicted an early spring. But just in case winter decides to linger, I'm ready. Will keep my basket of shawls and blankets close by a little longer. Do you "decorate" your house with shawls and blankets? They seem to be everywhere I look right now. And out in the yard---the bunnies have emerged! Currently they are hopping about, providing the inspiration I need for the March BONUS pattern. And here you have it. Coming soon . . . So, between dozing and snow gazing, and day-dreaming of butterflies and flower-covered cottages, many wonderful old patterns crossed my worktable this month. They just keep trickling in. It's always exciting. I never know what I am going to find. Recently, Bernice from North Dakota, a 91 year-old stitching friend, sent me some of her treasures to share on the PatternBee website. She tells me she's still stitching up a storm and it warms my heart to hear it. I just finished Cross-Stitch Bluebirds for tea towels (shown) and have two more cuties in the works that she contributed to our ever-growing vintage pattern archive. Bluebirds will be added to New Additions March 1st, along with two from my collection, Good Fun (McCall 1947) and Animals in Hats (a 1950's mail-order). And another one that I received last year--with much thanks to "Grandma Dottie" who unearthed Kitchen Parrot (Superior 1940's) from her own private stash. The holidays kind of slowed me down, but eventually these little treasures will be turned loose back out into the world again soon. Yay! I'm hoping I can talk Miss Grace into making another lemon loaf to celebrate. And then take some time to hunker as long as winter lasts. We are having a book sale! There's a new home for my books on the PatternBee website. (Without the middle-man I am able to offer them at a reduced price). Yay! If you want a signed copy, let me know, I am happy to do it. Both of my books are still currently available on Amazon, but only through the Marketplace; I reactivated my old account (I used to sell a few used books and DVD's from time to time), my seller account is under the name candyheart. However, the best price is still through me directly, purchased from the PatternBee website. So make a note! The 2017 Free Bonus Transfer is up; this month, featuring dainty hearts and a heavenly sleeping cherub. Oh. How I love long winter naps. Hugs all around to our dear stitching friends, who shared these little lovelies to add to the site. I've already started working on the new additions for March and April. Ah, spring is coming! But first, we have to get through fickle February, which has just arrived here with freezing rain in its pockets and snow following close on its heels. Just as predicted in the Farmer's Almanac; and you can hang your hat on that, it's rarely wrong. There's a stiff, cold wind blowing down from the north, whistling through the trees as I write. B-r-r-r.
A good day to fill up the soup pot and stitch. Cheers everybody! I love transitional months. There is always a feeling of expectation. Of what is to come. The weather, though usually fickle here in Oregon, can't seem to settle on warm or wet. Today we have both. And it is heavenly. So, after a flurry of serious housekeeping this morning, I went outside for some fresh air and found this . . . It was practically waving and shouting, "yoo hoo", I have arrived, and am ready for my close-up." So gorgeous. A complete wonder. It just appeared one day. We thought at first it was some sort of exotic weed, but couldn't put our finger on exactly what kind of weed it might be, so we just left it alone and forgot about it. Then buds formed. Aha! A Dahlia. And such a lovely one she is too! Ten inches across. A classic "dinner plate" Dahlia. Who knew. I love surprises like this. Over the weekend, I finally got around to lining an old drawer with some pretty scrapbook papers. This was an easy project that took about twenty minutes. Not really blog-worthy, but while I was working on it, I was reminded of a massive decoupage project I did inside my closet when I was 13. One that sent my dear old Dad into a tizzy fit, because you just did not glue things to furniture or walls or closet doors (as far as he was concerned). I was always doing crazy stuff like that in an effort to "decorate", because that tiny dark bedroom, along with my life then, was so dismal. Sad but true. Anyway, I worked on my secret closet project for months and months, cutting out and gluing to the walls, my favorite outfits from the latest fashion magazines (which I spent all of my babysitting money on). The closet remained that way for many years long after I grew up and moved away. Eventually, Dad took a power sander to it. Oh, and how he did fuss about it too. For years! As you can see, I did use a little more restraint this time and kept it simple. This is what I am working on now. I've had this vintage transfer sheet for a long while, an old WorkBasket freebie, and have used parts of it for various things, but never as a complete set with all the farm motifs. The calf is unusual, and the piglet is cute with a bow on her tail. And that rooster is just awesome! The Amish couple are darling too. A fun little pattern. If I finish it this month, I'll add it to the PatternBee website, otherwise look for it in October under New Additions. That's it for today . . . take care everyone! Hi everyone! It's been awhile, I know. January sure came and went fast didn't it? We have been so very busy here behind the scenes with lots of lovely little things happening. The most recent one being that we have finally and successfully implemented the new and improved PatternBee website! With our fingers crossed, it went live over the weekend and so far so good. I am really happy with it and proud to say, that it was entirely created from scratch and customized for me by my daughter, Grace (a year in the making), and I think she did a fantastic job. It is already making my life a whole lot easier. I created the graphics and she designed the software. No sir, no more html for me. We have moved on with the times. I should mention that we decided not to add tracking cookies to the site. This feature was built into the (now outdated) yahoo site-builder program. However we have never collected and shared data, emails or any other personal information and don't intend to. So what this ultimately means for the site is that the shopping cart will no longer remember your selections. The good news is . . . we have a better shopping cart! And a better search engine--all you need enter is the original pattern number and a selection of choices will pop up. To search specifics, the Pattern Directory organizes everything by maker and number. I love how this is database thing works. You also now have the option of viewing entire categories on one page or can scroll through and view them page by page as before. I hope you will visit the site and send us your feedback. Other lovely little things--more vintage pattern finds! Some have been sent to me, others I've scrounged around for. I keep adding them to the site as time allows. It's a work in progress. As you know. And work I love doing. So it's all good. This month I added six new patterns. You can view them here. I can't promise six new ones each month, but I will try and get to as many of them as possible. If there is an older pattern that you are searching for please inquire--I may have it around here somewhere and am happy to move it to the front of the "production line" whenever possible. My camera is gathering dust at the moment, so I will leave you with this cute picture (from my husband's cell-phone he shared from the barn). It's that hustle-bustle time again. There are so many things I want to do! And make. I think I'm almost ready to pick up my needle and thread again. In the meantime, I have found a wonderful little embroidered piece that I was working on a few years back. And since I am running a bit behind on some things around here I thought this would make a fun Bonus pattern for December. So, with a little tweaking, I have combined two stitcheries into one and added a few more characters to round out the theme. The entire sheet can be stitched as a picture, divided into segments, or the motifs can be used individually for decorating holiday linens, napkins, aprons, clothing or whatever tickles your fancy. This is just a preview of some of them. In addition to the Bonus transfer, the afore mentioned Honeycomb pattern is ready for prime-time now too and will be added come December, along with many more vintage surprises. I have been very busy here! Look for them in the New Additions section of the PatternBee website. Until next time, be well Stitching Friends! I've been hanging out with this wild and crazy guy and his band of merry musicians for awhile now, meticulously bringing them all back to life, pixel by pixel. This vintage pattern set called, The Vitamin Ball Orchestra is not entirely new to me though. I've had it's counterpart for many years: The Vitamin Ball Characters (c.1936), that I found as a loose sheet without its envelope. It's nice to see the whole gang back together again. Thanks to one of my long-time PatternBee customers, Barbara (from California), I almost have the complete set. She shared her find with me, and the best part is I get to share it with you! I'm still on the lookout for that last missing orchestra player though--wherever he may be hiding. I am still working on a few other pattern projects, the one mentioned in the last post is still on my desk, having put it aside to work on new submissions that have come in. Like this adorable tea-towel set. I love that little house tucked into the woods. The days of the week were added by request, as it seemed a bit sparse on its own. I do love the simplicity of it. More details about Woodland China here. Oh....passing by the window this morning, I saw this bright cascade of blinding color. Just an enormous burst of golden petals as bright as the sun. Yes, I do think spring is not far off, if not already here. The daffodils are waking up. The birds and bunnies are out and about. After watching that little backyard drama, I just had to include a sweet little bunny for the March Bonus pattern. And soup! We've made lots of soup these past months and plan to keep the pot simmering for as long as possible. Make Soup is music to my ears. The rain is back. It was preceded by thunder and lightning. All quite dramatic! We were in the middle of dinner last night when the flashes and rumbling started. It quickly moved through the area though--so I didn't have to hide under the covers all night. A few weeks ago, I went digging through my shoebox stash and pulled out another adorable pattern. I still marvel at the dates on these--this one was printed in 1946. It seemed perfect for February, so I got busy. The motifs are small scale, with heart appliques that can be used on the larger ones. The envelope illustration shows them worked on natural colored linen, so that the white flowers stand out nicely on the darker background, but other colors would be fun. I guess they would be used as embellishments on clothing and such. All of the motifs were given singly, however, when I saw the corner motif I got this idea to make a border out of it. The entire design is approximately the size of a sheet of paper--about 8" x 10". The center area can be filled in with words, a saying, poem, personalization, or special occasion (think wedding or birthdate), and turned into a pillow or framed as a picture/sampler. Lots of possibilities. The best news is, this sweet little border motif will be included with the new updated transfer pattern: Hearts & Flowers. Click the link to see more details. What's next? Well, I am finally finishing up a pattern project that has been on my work table since last year. I haven't been working on it for a year, it's just been gathering dust there as I have gotten busy with other things--but I finally got back around to it and now I can't wait to show you! This is what's happening outside today. Spooky isn't it? At least I can see the tree line now. Earlier there was nothing to see at all from the window, just a wall of white mist. It's been this way on and off for months now, with bright, sunny days breaking up the monotony from time to time. With all this gloominess outside, it's nice to have fun projects to focus on inside--and that's just what I have been up to. February tends to be a fickle friend, bringing with it a mix of weather. But, it also means that spring is not far off. With that thought in mind, and with hope in my heart for an early spring, I bring you the February bonus designs. Yes, dear friends, hearts and flowers win out again. (Sigh) What can I say. I am an optomistic romantic. OK. And more hearts and flowers . . . The 2014 Bonus Collection is complete---I am really on the ball this year. It surprises me too. (In case you don't know, these are all the bonus designs from 2014). Three more vintage patterns have just been added to the PatternBee Vintage Embroidery Shop. This one has been on my "to-do" list for quite awhile because of its complexity. The tissue paper transfers with the light blue wax is very difficult to reproduce with good crisp lines---these take a lot of time to clean up pixel by pixel. The designs are quite pretty though, nice for towels and linens. I have reprinted them in several sizes to allow for more project options. Options are good. Next we have . . . This darling dish towel pattern has a fun vibe and lots of cuteness. I was giddy when I found this recently. I mean, what's not to love about an apron-clad teapot? Besides the six motifs, I include additional transfer sheets with the center portion of each design enlarged (without the spoons) along with a selection of other elements for a variety of uses. Last but not least . . . cluck, cluck. Chicken wire anyone? I think this is so cool. I don't know what you do with it though. It is shown embroidered on the bib of an apron. That works I guess. It's part and parcel of Chicken Accessories (mentioned in the last post). This pattern has been uploaded to the Potholders category because I didn't know where else to put it. And it does actually have a wonderful stuffed 3D chicken potholder pattern along with the appliance covers and towel motif. So it makes sense. More "hearts & flowers" up my sleeve--will share them soon! With winter upon us, I am hunkered down over here at PatternBee headquarters (that little room at the back of my house), happily finishing up a few more pattern restorations. Occasionally I pop up for another cup of coffee, run out to the mailbox, or just watch the birds outside my window--but then I go right back in. I love what I do. As I sit at my desk examining the old motifs, I am amazed, honestly, by how many embroidery transfers were created between 1930 - 1960; hundreds! Every single company that produced them is gone with very few exceptions. I often wonder why no credits were given to transfer pattern artists. There is so little history to glean from. I've come to suspect that Laura Wheeler and Alice Brooks and others, were just trade names that were used and not real people as there seems to be no trace of them anywhere, with the exception of Ruby McKim whose family has carried on her legacy. I have always had a sneaking hunch that most transfer patterns were created by men cartoonists. I could be wrong, but this is not out of the realm of possibilities and in a way, it does makes sense. It would explain a few things anyway. Like this for example: Vogart #195. It's genius! And I love it. But it certainly makes you wonder. Baseball and BBQ at its core is a man thing. Could or would a 1940's housewife draw this? But I digress . . . I want to share what's new this month at the PatternBee Vintage Embroidery Shop! Starting with the backstory; the following three pattern sets were printed on one gigantic sheet of newsprint and distributed by Modern Handcraft sometime between 1950-1960--I am guessing by the postage amount stamped on the mailing envelope. It is just one of the many patterns I received from Ruth a few months back, that I shared about here. Next is what I am calling, Retro Kitchen, and for obvious reasons. At the time though, it was a typical modern kitchen--cake mix and all, which was a rather novel idea back in the day. The pattern comes with seven dish towel designs and two potholders. The clock potholder is especially sweet--one that I think I am going to have to make. If I ever have the time. The third set is Chicken Accessories; still putting the finishing touches on it now. Hope to have it up on the site in a few days. Here's the preview (above). These motifs are designed for appliance covers, but because the sewing patterns for them are very large I won't be able to include them. The motifs are too cute not to pass on though, and can be used for reusable market bags or what have you. Of course, if you have a pattern for an appliance cover they can be used as intended. There was one more pattern on this sheet--for a butterfly potholder. It seems the perfect shape for grabbing a pot handle and I suppose you could make a nifty needlecase out of felt with it instead, use it as an applique pattern, or just embroider it as-is for a pillow or tote bag. To make tracing the pattern easier I matched both sides---click here to download BUTTERFLY_PATTERN if you like. And last, but not least--two adorable patterns I found, both formerly McCALL and dated 1939 and 1952: Tiny Animal Kingdom and Dainty Touches have already been added to the archive/shop. These are nice for small projects, baby clothes, collars, and such. And that is all my pattern news for January. The February Bonus pattern is up next. Will it be the usual hearts and flowers or something else? Decisions, decisions. As you can see, I have been having a little fun with the NEW January Bonus design. I do so appreciate the suggestions--thanks everyone! I decided to run with the subject theme: everyday is a coffee day, from Lynn Marie. It expresses *espresso love* so perfectly. This motif can be embroidered on a dish towel, as a framed picture, or perhaps incorporated into a wall quilt surrounded by colorful blocks. I'm sure you can think of other things too. Look for it here after the new year rolls in. Oh! And there's a State Flower Quilt pattern waiting for you Lynn Marie! Happy Friday friends . . . it's been truly lovely hearing from you out there--I've missed you too! More than you know. Thank you for caring and checking back here with me again. I love reading about all the things you are doing. It inspires me to keep this blog going. I guess after 9+ years, my feet are dragging a little. And while the blog may sit idle--the time keeps flying by. I can't believe we are already thinking about Thanksgiving. We're having some family over and will be cooking up a storm next week. In the meantime, I've been procrastinating and instead of cleaning my house, I've been playing around with a shoebox full of vintage transfers. This kitschy coffee pot caught my eye--making me feel like a kid with a coloring book and a new box of crayons. Only now I can use a design program to experiment with different color combinations. Almost as much fun as actually doing the embroidery. This would make a cute dish towel motif--but it could use a phrase. Something short and sweet. Any ideas out there? I want to include this with the Bonus patterns offered on the PatternBee web site for December. Then you can have fun with it too. And speaking of fun . . . I'm pretty excited to tell you about another beautiful State Flower Quilt pattern I came across. This design block has shields framing the flowers with the state names, in full, at the top. The pattern also includes directions for making a simple lattice-style quilt incorporating all fifty states. It's contructed of 5 rows across, 10 rows down, with a strip border on each side to give it the extra width. Pretty basic. The original pattern wasn't in an envelope so I don't have an official date, but judging from the style of transfers I'm guessing 1950's era maybe. The pattern and more details about it can be found here. If you'd like a chance to win this State Flower Quilt pattern, keep reading. . .
For lack of time and planning, I'll just call this the coffee pot dish towel contest. Put on your thinking caps and submit a one or two-line phrase (in the comment section of this blog post), for the coffee pot motif above--and I will choose one to add to the design. I'll send the winner the new State Flower Quilt pattern reprint in exchange. And Congratulations to Diane of Lavender Dreams! She is the lucky winner of Mollie Makes issue #44. ..and Spring inches closer! The air feels lighter and the pale sun plays peek-a-boo in a sky of drifting clouds. From the window I am excited to see Western Bluebirds and English Sparrows inspecting the birdhouses. And I wonder, who will make the first move--as bluebirds are most particular, and thus take longer to make up their minds, so that when they finally do, the sparrows have already moved in. Someone needs to tell them, "the early bird catches the worm". However, some tools can be used for other things with delightful results and here we have proof. Peanut Butter cookies with waffle tops. I've always just used a fork to make the traditional criss-cross on the cookie top, but how about a meat mallet? (Thoroughly sanitized, of course). Credit goes to my daughter for this idea. For the cookies too, which were delicious btw. Not a crumb was spared. Speaking of crumbs, I've been busy with lots of yummy little things these past few weeks. New patterns from old patterns; updated sewing projects soon to be added to my Vintage Stitch Shop on Etsy, along with the monthly BONUS motifs for PatternBee; all drawing on seasonal inspiration wherever I could find it. Here's a sneak peek of coming attractions. The new "Welcome Spring" designs will be up March 1st, which is tomorrow by this posting. The image link (left) will upload the new designs then and they'll be available (with purchase) until the end of the month. I'm working on more free stuff too, will let you know when and where in coming weeks. From time to time, people have asked me if I might introduce the new pattern additions here on the blog. I've always thought that was a terrific idea and really meant to do it sooner. Time seems to be my biggest obstacle, but better late than never, right? So, today we have, from my personal collection, Vogart 257, first printed in blue on tissue paper and later printed as #669. It's a sweet little pattern with bunches of violets and bouquets, HIS & HERS pillowcase designs, with flowers and kittens; and they threw in a perky puppy for good measure. Because you never know when you just might need one. Our lovely 'winter wonderland' of snow and ice is now but a happy memory. Mail service has resumed (such a relief!) and all orders received after February 6th were shipped out Monday and Tuesday. I was never so glad to see my postal carrier, Rob. He walked all the way down my long icy driveway to pick up an armload of packages. Bless Him. So, I think we are all caught up and back on track. I'll have another new pattern to show you soon. I am working on it now: Roosters and Hens! Cold hands and cold feet too! January is always a busy month of pattern printing around here, with everybody ready to hunker down with needle and thread for the long duration of winter. I hope to join in that stitching solitude soon! I'm almost finished updating my website. A most tedious process I think. Lots of little details to triple check. These details are mostly just cosmetic changes, but oh, how this whole process does keep my mind spinning. I hope you like the new look and functionality. I keep adding buttons and links to make it easier to navigate. You may have to refresh the pages to get them to load a new. Let me know if you find anything finicky. I also want to thank the darling ladies who have written to tell me how much they enjoy visitng the website. It makes it all worthwhile. Enjoy! It's official. 2014 has arrived. Right on schedule. After the fireworks, we have a fresh outlook and are off and running again. The tree has been taken down and new calendars have been put up. The holiday treats are nearly gone; there was a skirmish for that last piece of fudge! My PatternBee website is back online again. When you visit the site, you may notice that the PDF purchase buttons are MIA. That's because patterns can now be instantly downloaded through my Vintage Stitch Shop. More about why and how here. I enjoyed the holiday break, but I'm glad to be back in the saddle again. Doing what I love doing: having fun! Hope you are too. Hello everyone, hope you all had a great Thanksgiving with all the trimmings and are enjoying lots of yummy leftovers. The crockpots are full and working overtime in my kitchen, churning out wonderful soups and stock and making the house smell delicious. I plan to make enchiladas this week too. This has become somewhat of a "tradition" around here with the leftover turkey. I am still trying to choose between the two versions; traditional chile sauce or the sour cream version. We like both equally well. Hmm. Decisions, decisions. I've been busy and distracted (in the very best of ways of course), and only discovered my blunder today. In short, the Vintage Stitch Shop is already empty--because my ETSY listings expired November 30th. That's about 15 days short of the time I announced that I was closing the shop for the holidays. Sigh. I don't want to relist everything only to close the shop in two weeks, so I do apologize for any inconvenience this may have caused. IF there was something you were hoping to purchase or placed in your shopping cart, let me know and we can certainly work something out. Winky Handmade and PatternBee Embroidery Shop are still up and running as normal. Our summer garden is blossoming in steady waves of color. The weather's been warm and mild, although a rain storm is moving across the sky now. It's hard to stay focused on any kind of work when all this lovliness is gently bobbing and waving just outside the backdoor. Even harder to ignore all the u-pick signs going up. Blueberries, in particular just now. And the resulting muffins that someone just pulled out of the oven. Not to mention the jam and pickles that still needs to be made. But then I see this, and am reminded that it all needs to go somewhere. Today I am sewing new curtains so I can hide some of it under the cutting table! I dare say, I am making progress one way or another. Shop News: The new bonus transfers for August are up on the PatternBee website today and they are really adorable. I've also been busy adding more older children's patterns to my Vintage Stitch Shop (etsy) as the bonus designs lend themselves so well to them. But the best part is, I'm having a Summer Sale and everything is 25% off. (Blog readers enter coupon code: TURKEYFEATHERS30 to receive a 30% discount!) There are also books, magazines, decorator fabrics, and oil cloth--great for covering picnic tables and chair seats. I hope you will check it out. The sewing studio is coming together. The paint is dry and the furniture is being moved back in. I admit there's been a teensy bit of procrastination during this process as I was rather enjoying the 'blank slate' look a little too much. After all, an empty room is full of dreamy possibilities! It makes my knees weak and my mind wanders. During this think-time though, a few changes were made and I'm quite happy with the results. I'll do a more in-depth show-and-tell when everything is finally done. I know. I said that a few years ago--but I really mean it this time! Now I am endeavoring to find homes for all the bits and bobs, buttons and bobbins, and the rest of my kit and caboodle. This is currently scattered about the house and filling a downstairs bath tub. Which is mildly embaressing, but I am thoroughly purging every box, bin and bag and reorganizing things for maximum efficiency. Maximum efficiency rocks in my world. It saves time searching and sometimes saves my sanity. I like knowing where things are; having a place for everything and everything in it's place. That sort of thing. I'm funny that way. Oh, that reminds me of a cool discovery I made while wandering around the bath section at Target the other day. Check out this handy table-top "scissor stand". I love it. It's metal and weighted on the bottom with a rubber grip so it's not tipsy. I suppose one could use it for pens and pencils too, or even toothbrushes--but only if one had no imagination. I made a new valance cut from old curtains in the spirit of "Use What You Have" and in keeping my cost factor in check, for it took no less than five panels. Both windows are side-by-side and enormous. The cove ceiling is also high making the overall scale of the room large, so I kept the same 5-inch rod with an 18-inch drop. The old valance was cute, but a bit heavy and dark. This one, I know, is not terribly exciting in contrast, but I wanted the background of the room neutral and this suits the purpose of hiding mini-blinds when they're drawn up and helps to soften hard edges at the same time. The fabric is tufted cotton, so it does have that small detail of textural interest anyway. It works well enough. So that's it for today. All is well and good. I'm motivated and working on getting everything done. But, inevitably life gets busy and pulls me in a dozen differnet directions. A family reunion out of town. Trips to the coast. Last week it was horse camp. Fun for sure, but I lose my momentum. And then I looked out the kitchen window this morning and saw all this lovliness. A reminder that: summer is here! True Blue is in the home stretch! With lovely pink binding. And I'm in a mad dash to finish because shortly, this entire room will need to be cleared out to make way for a long overdue make-over. I've been putting it off for years now, not wanting to uproot and unplug the HUB of my exsistence. I know fellow stitchers can relate. But the time has come at long last. Time to say, fare-thee-well to the last of the 'Desert Rose' colored carpeting, so popular decades ago. It's seen better days. In fact, I thought I'd seen the last of it when we moved from our house in California in 1994 (where it had been installed), only to see it again here, wall-to-wall, up stairs, down hallways and in every room. I have nothing against pink in my home environment; just like it better as an essay. Not the whole story. So, yes. There is much to do! And it occurs to me that I'll need to minimize my regular schedule to concentrate on finishing this project ASAP. That means our lovely little shops, PatternBee, Vintage Stitch Shop, and Winky (the girls shop), will all be closed after July 5th. IMPORTANT NOTE: If you have any items in your shopping cart and/or intend to purchase something within this time frame, please do so now, so that we can accomodate your needs. Shops will re-open after the 15th. Thank you for your patience and understanding. If you should have any questions or concerns about your order, please don't hesitate to contact me, I'll be able to access email on my portable laptop to provide any assistance you may need. Will TRY and get back here to update our progress if possible. And maybe share some photos of my finished 'True Blue' summer quilt. It's the Vernal Equinox, the first day of spring! The long winter is behind us now as we look forward to longer lighter days (and better picture taking). The weather, so far today has been a mixed bag. All bluster and rain one moment, then glorious sunshine the next. It keeps us guessing. As I mentioned in the last post, gorgeous daffodils are blooming all over the place. We were glad to have rescued these beauties before the wind and rain beat them down. The fragrance of this particular daffodil reminds me of gardenias, only more subtle. It's SO wonderful to be quietly sitting across the room and catch the scent as it drifts by. Just like a breath of spring. One of my sweet stitching friends recently sent me a few vintage embroidery motifs with a Spring theme. They were too cute to keep to myself. You can check them out over HERE. And I keep forgetting to mention this, but I've been adding a little more inventory to the Vintage Stitch Shop, so please pop over and see what's new. Maybe you'll find something you've been looking for or need. I've still got a lot of other stuff I hope to get listed in the coming weeks so be sure to check back from time to time. This is such a tedious and time-consuming process and not my first priority, so I'm afraid "stocking the shelves" is always a bit sporatic. Oh! I'm actually rounding the corner on the "Honeycomb" hexagon scrap quilt. Its nearly finished. Woot! Will take more pictures as soon as the sun comes back out. I've got camera in hand, ready to spring into action when it does. Hey everybody, I have a new blog! It's called, PatternBee Buzz and it's where I am going to park all the FREE pattern downloads from my website and *maybe* some of the projects from the turkey feathers blog if I can work that in timewise. Check it out over here. (There's also a link in the side bar under the PatternBee logo.) Hope you're all having a fun weekend. I'm winding down after running errands; about ready to flop down in my chair with a little nibble (I missed lunch) and finally get around to watching the first and second episodes of Season 3 Downton Abbey over HERE because new DVR didn't record it. (Probably because I forgot to re-program it.) We simply must get our priorities straight around here! It's November already. And fall is here in all its glory. Growing up in southern California, with it's mild round the year summer weather, I always had a longing to experience the seasonal changes, especially autumn. I'd actually daydream about it. Now, living here in the northwest, I've found my dream come true as autumn colors punctuate the landscape. It is wonderful to see the trees we've put in adding new swaths of color too. This red bud, called 'Forest Pansy', is normally a dark plum color, but look at the transformation it goes through in the fall. I had no idea when we planted it just how gorgeous it would be. It's a marvel to me, having survived being nearly torn in half by the wind shortly after it was planted. It was so badly damaged that we came close to taking it out at the time. Fortunately, we didn't, but gave it another chance; bandaged it up, threw in a pep talk, and now it is surely a sight to behold. I LOVE the little red maple. It's called 'October Fire' and it's about 6 years old, very slow growing--but it's getting there. The 'paper white birch' trees (on the left) are beautiful right now, but sadly they have been compromised by the copper birch beetle that has infested the valley here and beyond. We've been watching them succumb for years now, a slow process with the upper most branches breaking off until eventually there's nothing left of the canopy. This having to do with the tree's food supply getting cut off by beetle larvae--which we never have seen, only tiny holes where they go in and come out. This heartbreaking news came from a number of proffesionals that came out to look at them. Most birch trees have a relatively short life-span (about 20 years) before they start having issues. Our trees are about 20+ years, so aggressive action is not an option. Apparently, there's very little that can be done to save birch trees in this condition. I'm afraid, the trees are living on borrowed time. I am fully enjoying the color show, inside from the windows and outside in the rain for as long as it lasts. Because in another week or so, this technicolor scenery will all be but a memory. So... not wanting to let it all slip away entirely, better bring some of it inside, I say. Here in the far corner of my kitchen, a fresh display of seasonal color; a big turkey platter at the center of it all setting the tone. This old buffet and hutch has been with me for many many years now, having traveled all the way from England, I'm told. It still has the original lighting with ancient wiring that is not compatible with what we have here in the U.S. Don't know why we never replaced it. Just one of those minor details that gets overlooked and eventually forgotten when life gets busy I guess. I'm using a short string of twinkle lights as a backdrop of "sunshine"; a counterpoint to these dark stormy northwestern days of November. The cupboard was originally stained a dark walnut with hammered wrought-iron pulls and handles. It looked positively medieval like it had been pulled out of a stone pub. But it was in perfect condition being hand-crafted from solid pine and I could see the potential for cuteness with just a few minor changes. The buffet (below) has four more drawers across the top with four cabinet doors below, where I keep linens, china, teapots, candles and a bunch of old flower vases. It's very handy for things like that, and after all these years, I still love it. Vintage Embroidery Shop News:: The PatternBee website got a make-over. It's bigger and brighter with better functionality. For one thing, the 'view cart' button is back. Yes, I know, it's sort of convenient to have that, but at the cost of aesthetics I'm afraid. Paypal if you can hear me, please make some CUTE buttons--this horrid creature has to go! (A dainty one would be SO purr-fect.) At this point, my eyeballs feel like they will be crossed forever! It's always a tremendous task updating this site. Weeks and weeks of clicking though literally hundreds of pages. (That's where I've been and what I have been up to during the quiet times away from my blog lately in case anybody was wondering). Please drop in and let me know if you find anything that's wonky or doesn't link where it should. I'm still finding a few issues here and there and fixing as I go. Sometimes it's hard to see the forest for the trees. Gosh, my time is up...time to get going. There is always much to do around here! And of course, my sympathy and prayers go out to all those who have suffered loss from the east coast storm. This cute little number is a costume I made for one of my daughters when she was ten. It was for a pioneer theme-party we attended one summer. We all dressed up! Since then, over ten years now, other little girls have slipped into the red calico, with bloomers and bonnet, and have enjoyed the plain frills of a simpler time. My eight year-old granddaughter has recently discovered the Laura Ingalls-Wilder books and 'Little House on the Prairie', so it will likely be worn and enjoyed again VERY soon. These are the kind of sewing projects I love the most. I might add, in case you're wondering; the buttons down the back are just for looks. Hidden beneath, are large snaps for small hands to easily manage. Pattern used was Simplicity 9136, dated 1970. (This one shown in my shop was sold, I mention it for those who might want to find another.) And now for some good news. . If you're looking for some fun sewing projects for kid's clothing and costumes, it's SALE time over at the Turkey Feathers Thrift Shop. Take 25% off your purchase by entering coupon code: REDCALICO25. Offer good til October 10th. This brings back memories! It's a little watercolor I did in 1980, back when I was taking drawing and painting courses at Coastline Community College (and later at Orange Coast College) in the evenings after work. I found those carefree classes a welcome distraction and a godsend during a difficult time in my life. The instructor was Helen A. Prothers. She was an amazing artist herself, having been a professional fashion illustrator for most of her adult life, and later did technical drawings for anatomy books. Her passion for travel and adventure took her all around the world, filled her sketch books and influenced her colorful, detailed paintings; depictions of the favorite places she had visited. Teaching these classes enhanced her spare time after "retirement" and kept her from being lonely, I think, for she never married and had no close family that I knew of. Recently, I found this painting along with others, and the well-worn teaching manual she used. It was at the bottom of a box of artwork and stuff I'd thought had been lost. It was quite a thrill to see all this again. And the teachings, with so many fun and informative lessons. Lessons that can be shared with my daughters, who also like to dabble with brushes and paint. These paintings (and dozens more) were done as objects of study encompassing spherical forms, opaque fruits, conical shapes, wood grain, shiny textures, working out complementary and analogous colorations, veining of leaves, and various techniques. Often, as I fussed over a painting trying to achieve some sort of unattainable perfection, Helen would patiently come over and reassure me that things were going in the right direction and to just keep going. She was a marvelous teacher and graciously shared all her tricks of the trade. I was grateful for that and learned a lot under her direction. Being older and wiser, I think she enjoyed having a younger person to mentor. One day, we ran into each other at the local market and discovered that we lived within walking distance of each other. After that, we became neighborly friends, dropping in on one another from time to time. She would show me her latest painting or an idea for one, inspired from the beets she'd pulled up from her garden that morning, or the mocking bird she saw sitting on a fencepost. I was fascinated by her. Helen could find inspiration anywhere, in anything and taught me how to see things that are often overlooked in the common everyday experience and turn it into art. Hence, my little red watering can. Not much on its own, but a worthy subject of study I suppose. Funny that I should still possess both; the painting and the watering can, after all these years. And...as it turns out, just the thing for my June Bonus designs. Summer is right around the corner and I'm ready! 1) Re-open the PatternBee Vintage Embroidery Shop. I'll admit, it was nice to have a little break from all the printing and shipping, but I'm getting excited about jumping back in and conversing with everybody again on Tuesday. I miss you guys! 2) Finish vintage pattern restoration/contribution for "Baby Blankie". Thanks again Cathy, the new pattern will be on its way to Canada soon. (For everybody else, find it on the website under 'New Additions'. 3) Create the January 2012 Bonus Design. I went straight to Valentine's Day with this one, with a LOVE theme, so you have plenty of time to stitch up something cool for gift-giving if your heart so desires. 5) Choose a winner for the Pinky Rose Give-Away! I know you are holding your breath; I'm rolling up my sleeves. Check back tomorrow to find out who won. It might be YOU! If you haven't entered yet, hurry and do so before the comment section is closed. OK. I think that's it for the blog, 'til next year. See ya on the flip side friends. Have a safe New Year's Eve! We are still bustling . . . how about you? The girls are busy crafting up more goodies for Winky Handmade, the Etsy shop they manage. Don't forget to stop in and have a peek. I just listed a few of my mini quilts--the two above were sold, but . . . I have more! I will also be adding these small felt needlecases I've been stitching up in the evenings. (I'm still working on the peace dove.) Just some of the fun stuff. Plus, I'm still working on the "summer book" for my granddaughters, and have some really exciting news about that to share, along with a GIVE-AWAY. You won't want to miss this, because I think it's something everyone can appreciate and use. More details to come . . . Right now, I'm listening to Corrine May. She has an exceptionally beautiful sweet voice. Her rendition of 'Joy to the World' has me in tears. Joyful tears, mind you! No booming Tabernacle Choir stuff. Listen online--make a Corrine May (Holiday) channel and let the calm envelope you. Above:: I forgot to share this fox applique from the 'Sweet & Simple Country Quilts' book I blogged about last month here. He's too cute! Perfect for a bedroom pillow, I think. Click on the image to visit the gallery from whence he came for inspiration.
. . . And what better time for a blog remodel to usher in the new season! What do you think of my new digs? If you are viewing from afar via subs--please, come on outta there and see what's shaking in the real world. Come sit a spell on my front porch. I've got it all gussied-up for Fall. Make yourselves at home. Have some hot cider and homemade pumpkin bread. Listen to the wind in the trees, watch the leaves drift along. Breathe in the crisp cool air. Just holler if you need anything. I'll be deep in the bunkers here at PatternBee Headquarters, that little room at the back of my house where all the FUN happens. (smile) The dust is settling and I'm slowly hooking back up. Very soon the website and printers will be happily buzzing along again too. Everything should be in order and organized for a seamless re-entry before the shop doors open again October 1st. I'm almost ready, keeping my fingers crossed. Other shop news:: My two crafty girls Grace and Ginger, have been busily making things throughout the summer and are now, as we speak, "stocking the shelves" of their Etsy shop. I'll share the link when they are ready. It's their call. I may even add a few things now and then. I tell ya, it's all very exciting! As I write, a pair of deer just sauntered in and are grazing outside my window. Their darker coats are just another sign that fall is here and winter's not far off. Time to get cracking! Fun photoshop & photography blog: Kim Klassen Cafe offers tons of creative effects, tutorials, and e-courses to achieve amazing results with your photos. Gallery of images here. Very inspiring! Another site with hundreds of free digital clip-art, tutorials, projects and techniques: The Graphics Fairy. Saltbox Treasures Etsy shop--when you feel like thrift-shopping in your slippers. And check out Julie's charming companion blog for more inspiration. Gorgeous knitting and crochet eye candy from Knot Garden, and a Forget-Me-Knot tutorial--so sweet! Free Felt Patterns gathered from around the web (with permission) and organized into one nifty spot. Love it! Farewell February -- hello March! March has a reputation for being a month of mixed weather as it transitions from one season to another. Wind, rain, snow. That, "IN like a Lion, OUT like a Lamb" theme often rings true. We had a winter snow storm last week that felt like real winter had finally arrived--with temperatures dipping into the teens--but then it left just as quickly. I'm noticing signs of spring as I look out my studio window today. Flocks of red robins are swooping in and covering the lawn, hopping and hunting worms in the rain. The Canadian Geese have also returned to their wetlands resting spot, but seem to be circling--maybe undecided about whether or not to forage north just yet. Perhaps a sign that winter isn't quite over up there. Or anywhere else, for that matter. There is just no predicting the weather, even for the geese, it seems. And no end to the discussion of it. From my backdoor, I spy spring! Even though the tree is gone, the bulbs continue to perform their magic. A few small daffodils are starting to poke their heads up, and other small creatures are slowly coming out of hiding after the long dark months. Spring does seems to be right around the corner. These were just some of the things that I took back to my drawing table for inspiration as I worked on the March Bonus Designs. Yes, a "mixed bag" for sure! Good News: Your prayers and good wishes regarding my "computer escapades" seemed to turn the boat around. Plus a lotta help from my friends. I have to give the Mister and Ryan, a co-worker, much credit too. It was their quick thinking and ability to patch the old girl back together; I don't know how they figure this stuff out. It can be so complicated and tricky sometimes. But the main thing is, QB is back online and humming. Again, I appreciate everyone's patience, and hope you enjoy the free pattern sent as a little "thank you." So what's next? The Hawthorn for Missouri, that's what. I had a little extra time on my hands yesterday and got started on it and am nearly finished now. Will post it soon. No. I haven't moved away--or left the country. I'm still here, just sitting with a new perspective. Across the room from my usual northern exposure. The east facing window to my right is flooded with sunshine today. It's a marvel of marvels, I tell you--especially nice after some dark wintry days. And maybe just a bit blinding. But I'll take it any old which-way it comes streaming in. I'd go outside and bask, but it was only 32 degrees the last time I checked, so I'm going to take a rain check on that just now. However, the sunshine, as wonderful as it is, is not the reason I am sitting at this end of "PatternBee Headquarters" today. (That sounds very official, but really this is just a small room at the far end of the house--where I run things.) Most of you know that, but I still get the occasional email or letter addressed to "Dear Sir" or "To Whom It May Concern". I don't know why, but that always makes me laugh. I lovingly refer to this biz as "a one-horse operation". Which suits me just fine. Where else, I ask you, can you saunter in to work in your jammies and slippers? No, the reason I am over here today is because, yesterday afternoon, without a hint of trouble or warning, the "Queen Bee" crashed. She's the one with all the pattern files. She carries the motherlode. Ironicially, we were in the process of upgrading the hard drive; it was to be done this upcoming weekend. Now we are doing it sooner than planned, in a much more frenzied sort of way. If you know what I mean. So if you are waiting for a PDF or print transfer or any response to questions from me, there will be a teenie weenie delay. Of course, if it is going to be longer, I will let you know and send refunds if necessary. But if you don't mind the inconvenience--I LOVE YOU! I'm totally hugging you right now...and Thank You for understanding. Also...the new February Bonus Designs: "Hearts Galore" is done and ready to upload, but again I can't do it with "Pinky" (my lovely little laptop here). Once it goes up on the website, that will be a sign that things are up and running smoothly around here again. Let's hope so anyway! OK. Here's a wonderful find. Some of you ladies may remember these fabulous candy-striped towels that were so common in grandma's day, but over the years became scarce. That's why I was SO happy to discover that these old-timey towels are once again available. They are just so cute. And they are perfect for embroidery. I recently purchased these, by the yard, from the Susan Branch website. I must say, the quality is top-notch and a pleasure to work with. The sides are hemmed--you need to hem the ends though, which is easily done. (I turned under 1/2" twice and stitched straight across.) For non-sewers, Colonial Patterns now offers similar towels in finished sets of twelve! I'm stocking up. For inquiring minds...I used 6 delicious strands in outline and back-stitching for most of the designs here. 3-4 strands for small details, like stripes on the candy canes, faces, and lettering. (The designs are not necessarily limited to towels either, you could use them on a pillowcase, or individually to decorate other items.) Enjoy! For me...I think it's time to bake some cookies! As often happens this time of the month, I find myself scrambling to get the bonus transfers up on the website in time. Inspiration (thankfully) came when I found this lone quilt block in my basket of odds and ends; waiting to be made into a pillow, to match this quilt. When I saw it, I knew at once it was just right for the season! So here we have for your stitching delight, one determined turkey...strutting home with her pumpkin tucked safely under her wing. To be baked into a pie of course! Other stitching news...I just finished another State Flower Quilt block, will add Maryland soon...maybe Wednesday...still catching my breath after a busy weekend. Here's another sweet quilt from the Mennonite Quilt Show. Sunbonnet Sue and a companion butterfly in various activities. I've finally found time to get back to the pattern restorations. Bundles of little treasures have been trickling in for months now, and I'm happy to tell you that they are slowly but surely making their way to the website. This batch (above) was sent in by the women's fellowship of the Maple Grove Church in Ashland, Ohio who make baby quilts for charity. They were thrilled to get reprints so they could carry on their work and were happy to share these cute designs. These vintage WorkBasket inserts just arrived from Jennifer. That squirrel is so adorable! Some flowers mixed in here too. These will be fun. Here's another batch I just acquired from a thrifting adventure. I bought the lot sight unseen. There are cut fragments of some, others are in tact. Not sure what I will do with these yet. Found these last year at a yard sale. Some were quite gigantic! I reduced the great big ones and divided it all into seven distinct sets. They are up on the website now under the category: Quilts & Crafts; halfway down page 3 as follows, Wildwood, Abundance, Birds & Blossoms, Old English, Blooms & Borders, Shangrila, and Country French (under 'Feathered Friends'). Lots of sweet stuff here for home stitching. And more flowers! One can never have too many flowers, now can one? Also, soon to be added will be more nursery rhyme quilt blocks. They are on my work table in progress at this very moment...so that's where I'll be for awhile. All the newest pattern additions are HERE. Hey Stitching Friends . . . Exciting news! It is finally time to tell you about my new Indie book. 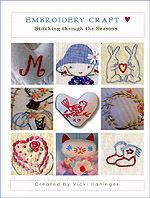 It's called, EMBROIDERY CRAFT:: Stitching Through the Seasons, and it has just been published. Signed copies will be available (from me) after September 1st, but the book can be purchased now from the publisher's print-on-demand website here. I'm told it will be up on Amazon toward the end of the month. I'm super excited! Gathered together into this book are some of my favorite stitched pieces along with many of the projects you asked for. I have to say, I really appreciated everybody's input and took it all to heart as I selected which things to include and I think there's something for everybody at every skill set. Inside, it all appears within the framework of my home, our backyard gardens, with glimpses of family, including the infamous 'Lily Margaret' (that femme fatal feline of mine), all of which has been designed, stitched, and photographed by 'Yours Truly' (I'm blushing a bit), making this book highly personal and maybe just a little quirky--like this blog. What's more is, it's sprinkled with sugar, and love, and happiness. And yes, a few polka-dots might be scattered here and there too. But I bet that you already expected as much, right? See? I told you. Polka-dots . . . But besides the polka-dots and the embroidery love, I've shared some thoughts on sewing spaces and fabric storage, provided a basic list for tools and supplies, some sound advice about materials and basic sewing techniques, along with an embroidery stitch guide. At the heart of the book there are 30 small stitching projects organized to compliment the changing seasons. Most of the projects can be made to fit any season or theme just by changing the embroidery designs though, so you do have many options and room to apply your own creativity no matter what the season. And speaking of embroidery designs . . . there are over 100! These can be traced directly from the book. However, I will also be offering them as iron-on transfers for a limited time on my website. How long I do this I can't say--I'll just wait and see how it goes. So if you want them, better to order sooner rather than later, because I can't guarantee they'll always be available--indefinitely. The transfer collection is available here. Let's see, what else can I show you? This section covers simple applique techniques with an example to follow that will help hone your skills and make you smile at the same time. Here we have examples of embroidered embellishments for handmade infant clothing. Vintage embroidery with a fresh approach. These are just darling and very simple to make. Patterns for baby kimono jackets are not included. I used an old McCall pattern, but these styles are still popular and available through most pattern companies. These pages were so much fun to do! There are a total of 12 "theme samplers" (as I call them), that can be stitched as shown (above), or the designs can be used individually to embellish other items. So that's it, in a bloggy nutshell. My hope is that my little book will appeal to everyone who likes to stitch--newbies and old hands alike. 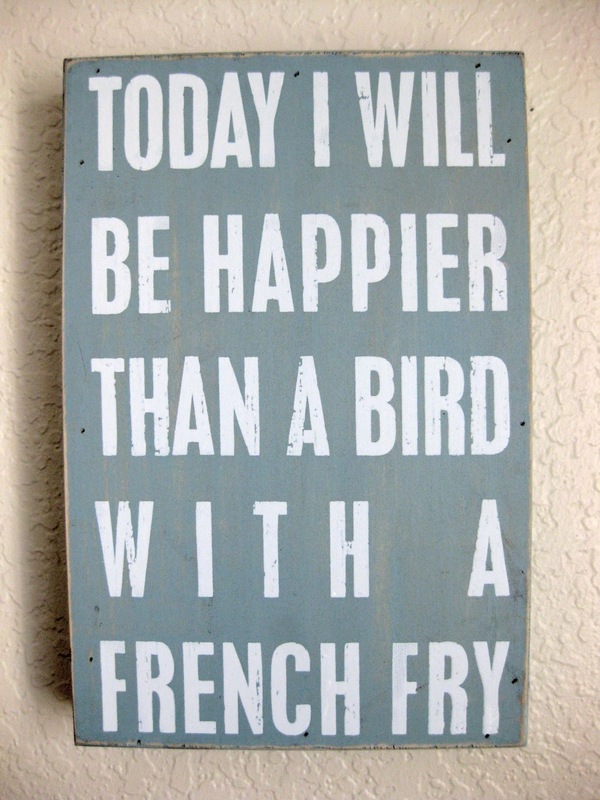 And not only that, but that it bestow *JOY* as you do so! To kick things off, I think a Give-Away is definitely in order. Here's the game plan . . . I'll reserve the first copy (signed by me), PLUS an iron-on transfer collection set for one Lucky Person anywhere on the planet. I'll choose and announce a winner sometime after September 1st from among the commenter's on this blog post. But wait, there's more . . . . Some other unrelated excitement: Saturday (August 21) Turkey Feathers Thrift Shop will be open for your perusal! Come on over and check it out. There will be patterns! For weeks now, I've been purging my pattern collection and re-discovering lots of little gems. My old "pattern chest" holds decades of wonderful patterns and just as many memories. If you've ever sewn clothing for the people you love, you'll probably understand that sentiment exactly. Oh, I can barely stand to part with some of these. But I'm happy to pass them along. And I really do have plenty more to keep me busy sewing for a long time to come. OK, that's all for now. I'm going to a party for my granddaughter who is turning six and I need to go wrap some presents, pronto! My indie book of handmade embroidery projects is done! Yes, it's true! Woot! My winsome home team of trusty assistants and I are meticulously going through the second proof right now as I write this, and hopefully it will be published and available in two shakes of a lamb's tail. That's the plan as I know it anyway. For one reason or another, this little stitched piece was one of the projects that didn't quite find a place in the book, so yesterday I decided to turn it into a "sampler" and am offering it, somewhat fortuitously, as a Bonus Design on my website instead. That's what happens when July sneaks up on ya...you improvise, and follow along in the tradition of: "use what you have". Makes perfect sense. So get it while it's hot off the presses, a new design will replace it in August. I will now need to add some lettering and fill the heart with initials and a date, but probably not any time soon because I really need to tie up all my loose ends (and threads) first. I promise, a sneak peek at my new book very soon! The Toadflax family live in the hornbeam tree next-door to Crabapple Cottage. On cold winter evenings, it is very cosy inside the tree, and noisy too, with four boisterous children running up and down the stairs. Wilfred, Teasel, Clover, and Catkin share a nursery at the top of the tree, and as the snow started to fall, Mrs. Toadflax found it difficult to keep them quietly upstairs in bed. Mr. Toadflax had been looking forward to some peace and quiet, but just as he was helping himself to another bowl of hot chestnut soup, he heard the creak of Wilfred's paw upon the stair. "Why aren't you in bed, Wilfred?" he called. "It's very late." "But it's snowing!" shouted Wilfred. "Toboganning tomorrow!" It is a comfort to know there are many Brambly Hedge peeps out there. Thanks for checking in. It warms my heart. I love this cozy Brambly world. This story segment is quite appropriate for the season, I think. Especially, since some of us are still wrapped snuggly in hibernation mode around here. I told you I was inching into the new year slowly. . It's been a mild and (so far), a dry, winter day--but we are on storm watch once again and hunkering down with sewing and great steaming pots of hot chocolate to see us through. No snow in the forecast this time, but lots of rain. I'm inside for the day, working on some current projects. I usually have several going at once, and with any luck will have something to show for it all soon. 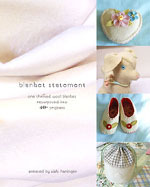 Blanket Statment wholesale orders:: I also want to mention that I've taken down the wholesale info since the book can be ordered through traditional methods now. CreateSpace handles this very efficiently which means I don't have to drop-ship orders or keep an inventory; so if you want to order copies for your library or book shop, just ask them and they can do so. PatternBee PDF Patterns:: The good news is the new 2010 bonus transfers are up on the website and flying out the door already...however, the bad news is I will no longer be offering them in PDF format. I know, I'm sorry--but this is no longer possible. Also, if you order PDF patterns to be sent to your yahoo account, the new SpamGuard filters everything and you need to turn it off or change your preferences to receive large image files. Be sure to check your SPAM folders within 24-48 hours after placing PDF orders. If they aren't waiting in your IN Box, they are most likely filed as spam. Files may also be auto-deleted if you don't save them to your desktop before the pre-set default time is up or just deleted without warning. Feel free to email me if you need your patterns resent or if you have any other questions regarding your orders. Thanks! No time for the real thing--so today we have a photo quilt! I grabbed a few pics from my files to remind myself to pull out my needle and thread again. Summer was exciting and busy, but now I'm ready to wind down, wrangle up some new ideas and settle in. It's been way too long, evidenced by all the new fabrics and thrifted goods I have continued to bring home (which are piling up), and by the dust that has settled on all my work surfaces. A thorough cleaning seems to be in order. And not just in the studio either. [Sigh.] Blame it on the pickles. These images remind me of some of the sweet little things in life. Miss Cross-Stitch Kitty in the right top corner is embroidered on a child-size apron that I made a really really long time ago. My girls outgrew it, but it's one of those things that's so hard to part with because of the memories it holds; baking cookies, rolling out pie crust. Sweet voices. Small hands and faces powdered with cake flour. The motif is one from a set of old Aunt Martha's iron-on transfers; still found here. The Coffee 'N' Cake motif is part of a vintage pattern set I've made available on my website. I'm also happy to report that my new Embroidery Directory is done! Now THAT was a project. And will continue to be a work in progress as it requires updating from time to time. If you know what you're looking for it will help you find it on the site. I love it because it catalogs everything for me--no more hunting and digging through boxes when someone asks me if I have a particular pattern. It's all there. Or almost all there. Like I said, a work in progress. Also--when you go to the pattern info pages, hover over the images and the original pattern source or envelope will appear like magic. Please let me know if you find errors or any crazy things happening on the site. I keep finding little things even though I've gone over it a thousand times. It's inevitable I guess. OK. Back to the apron ramble...the redwork flower in left lower corner, adorns (yet another) child's apron that I made from an old linen tablecloth that had seen better days. The edge of the cloth made a beautiful hemline. Jumbo pix here. I've been receiving such good mail lately...and as a result I've been crazy busy. This bundle is from Mary of Billings, MT. Most of the patterns belonged to her Mother and Grandmother and I'm so happy they saved them. I was able to reprint quite a few designs for pillowcases. I'm always getting requests for more of them, so there ya go. ( check them out over here.) Yep, the PatternBee website has been dusted off and is back online and open for business again. Seems there's always room for improvement; I still have a few more things I'm working on behind the scenes, but the site will remain up, so not to worry. Plus, I've got another bundle of vintage patterns--from Rochelle in MI, that will be making their debut on the new additions page soon. Thank you Ladies! When you visit my vintage embroidery shop you will find the site closed until mid-month while we make a few improvements behind the scenes. Nothing major, just a little spruce-up. All pattern orders that have already been placed are being processed and shipped without delay. If you have any questions or concerns about your order feel free to contact me (link in sidebar). Have Laptop, Will Travel. . . so where ever I may roam, I'm usually accessible and will do my best to get back to you as soon as possible.